Girls Can Do uses a “hands-on” community-based outreach model to ensure we engage a diverse group of girls with an emphasis on underserved girls. Our Girls Can Do Ambassador volunteer program supports and collaborates with partner organizations, community leaders, and students as they create groups within their neighborhoods to come to the event together in the spirit of mentorship and community building. Together they take the bus, drive, or let us know if they need a ride so that Girls Can Do can provide them with transportation. 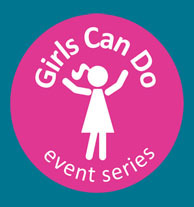 Girls Can Do Events are targeted towards middle, high school and college aged girls, however we welcome all girl-supporting individuals to our events.